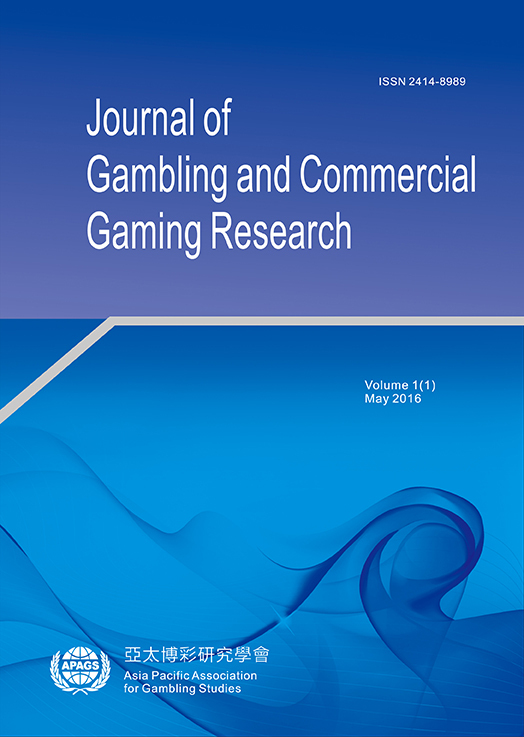 Journal of Gambling and Commercial Gaming Research(JGCGR, ISSN 2414-8989 ) is the official journal of Asia Pacific Association for Gambling Studies (APAGS). The journal is an international interdisciplinary forum and reference source for gambling and commercial gaming research, focusing on issues surrounding and research concerning gambling and the gaming industry. The journal’s readership is international in scope and includes gaming researchers and practitioners from both the academia and the industry. All papers in the journal undergo rigorous double-blind peer review, based on initial editors’ screening and refereeing by two anonymous referees. Submission of papers on any topics related to the focus of the Journal is welcome. Dedicated to promoting gambling studies, this journal is open-access and free of charge to readers and authors (no publication fee). Please register as an author online first to submit your original paper.